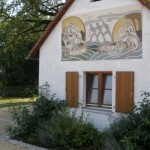 For many centuries people have repeatedly attempted to connect northern Europe, the Rhine basin, with the southern part of the continent, the Danube basin, via a waterway. 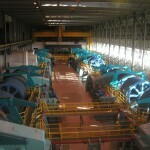 The success of these plans, however, was dependent on the technical and engineering capabilities of the time. 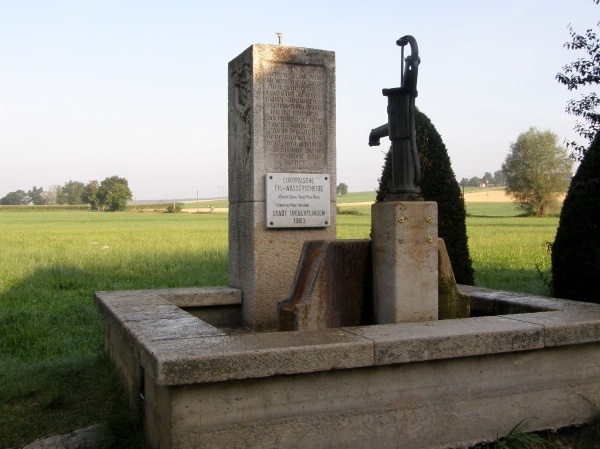 In around the year 793, Charlemagne (Charles the Great), King of the Franks and later Holy Roman Emperor, had an approximately 3km long channel dug starting at the village that today is named Graben near Treuchtlingen across the watershed divide, which separates the north and the south at some 419m above sea level. 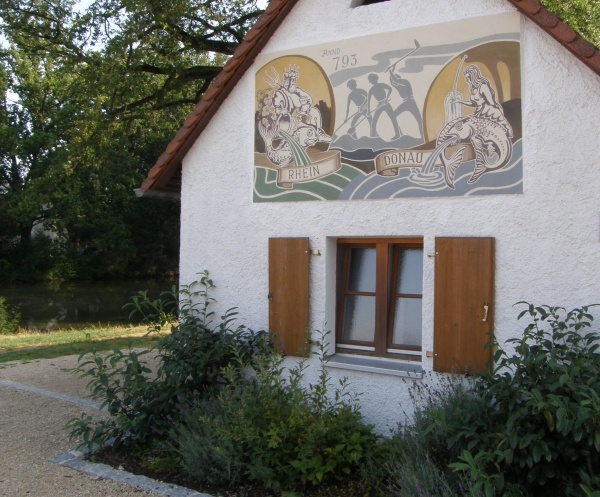 He wanted to create a route for merchants who transported their goods from the Rhine River along the Main River and further via the Swabian Rezat River to the town of Weissenburg. 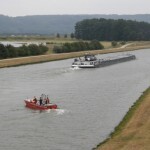 Via this channel, shipping would have been extended to the Altmühl River and the Danube River. However, due to insurmountable technical reasons this work was never completed. 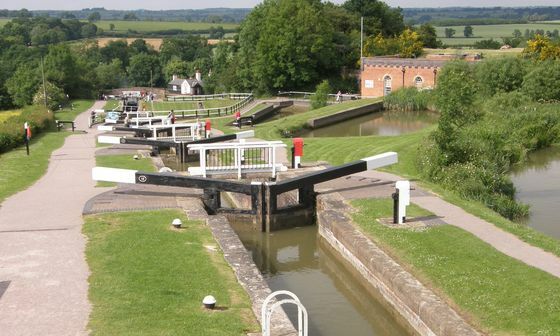 In the early Middle Ages other attempts were made at the creation of the waterway, but they did not come to pass. 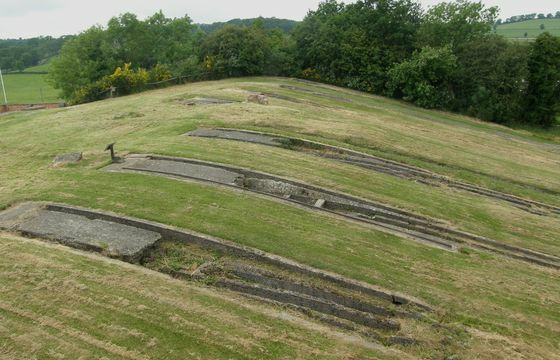 Traces of this work remain evident even today in the form an approximately 800m long flooded “trench” and mounds of dug up earth, which are testimony to the grandeur of the project. 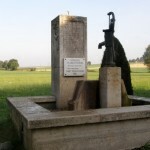 A very interesting structure in this location is a well with a pump, built precisely on the boundary of the watersheds – a stream from the well flows “into two seas”. 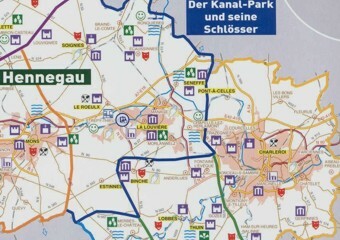 The second “attempt” was successful and resulted in the Ludwig-Danube-Main Canal, connecting the city of Bamberg am Main, through Nuremberg, with Kelheim on the Danube. 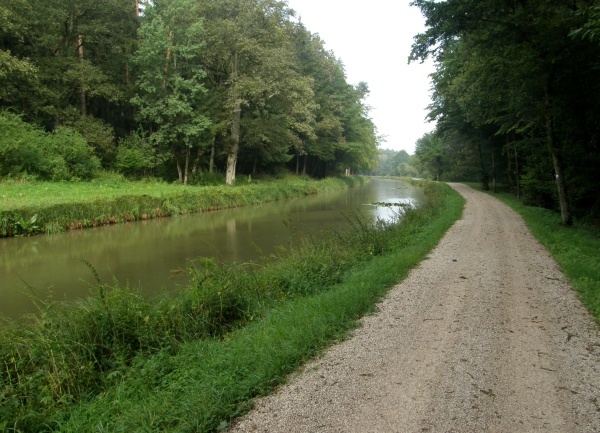 The canal was built by the Bavarian King Ludwig I in 1836 – 1846. 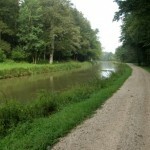 The canal was 172.4km long. 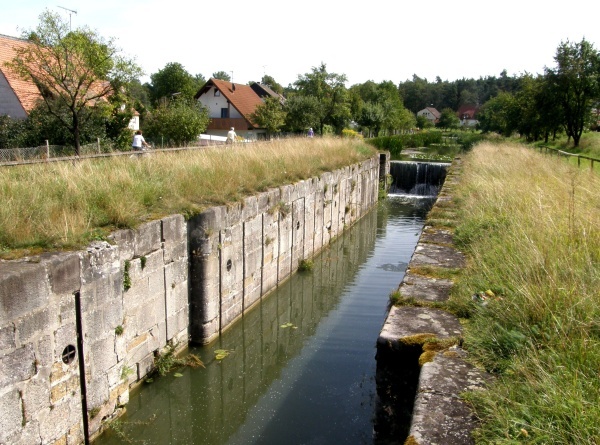 100 locks were built in order to overcome the 417m-above-sea-level watershed divide – 187m “up” from Bamberg and 79m “down” to the Danube. 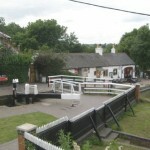 The locks enabled the passage of boats that were up to 34m long and 4.5m wide. 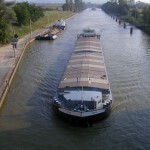 With a maximum draught of 0.7m, boats were able to carry up to 120 tonnes of cargo. 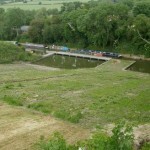 The barges were pulled by horses walking along a towpath. 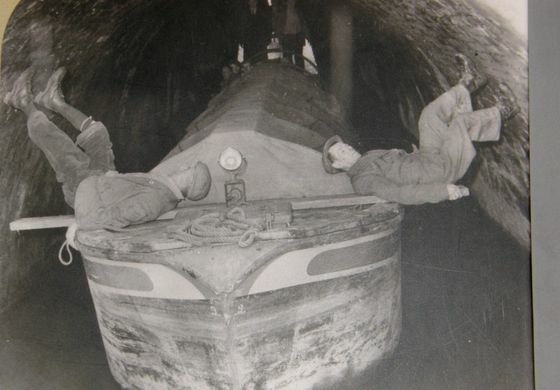 The first years of the canal’s operation were very successful. 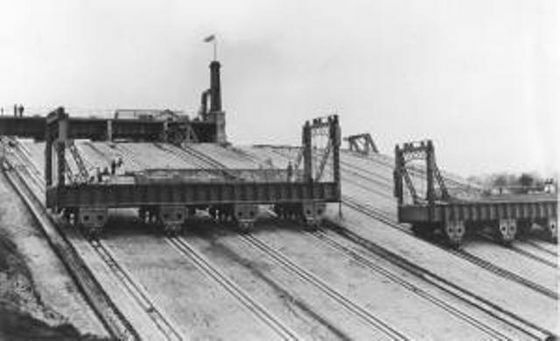 Approximately 200,000 tonnes of goods were transported to several ports, the largest one in Nuremberg. 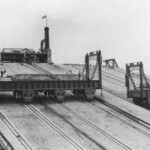 However, competing railway and road transport began to assert themselves and by 1940 water transport had decreased significantly. 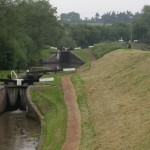 That is why in 1950 operations were terminated and the canal was abandoned. 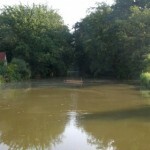 What does Ludwig’s Canal look like today? 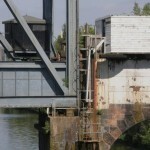 Its midsection has been partially preserved. 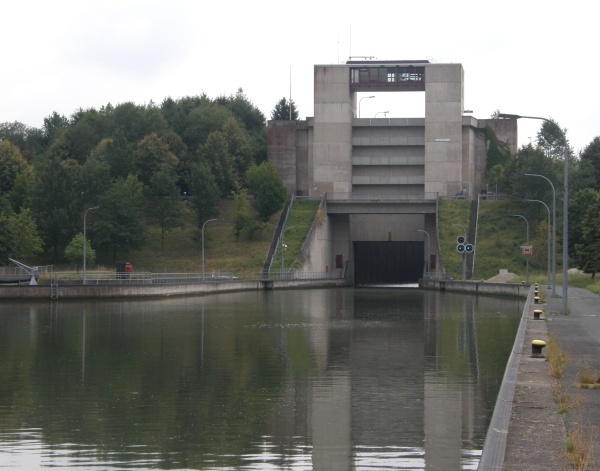 The body of the canal between Nuremberg and Bamberg was used to build a motorway. 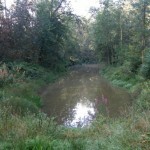 The canal was destroyed in the Altmühl River valley as a result of the canalisation of the river in order to make it navigable. 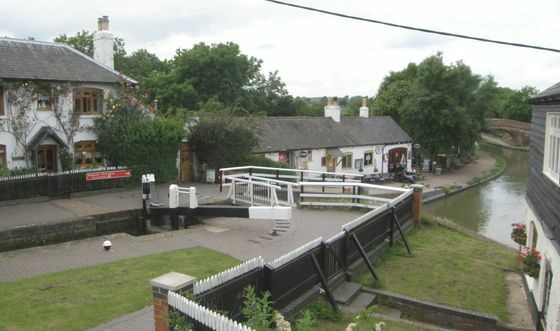 Even preserved sections are often interrupted by road embankments and the locks are extensively damaged, overgrown and, of course, without gates. 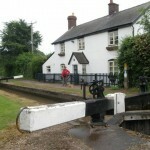 However, the canal is still filled with water and in many villages it constitutes a “romantic” nook. 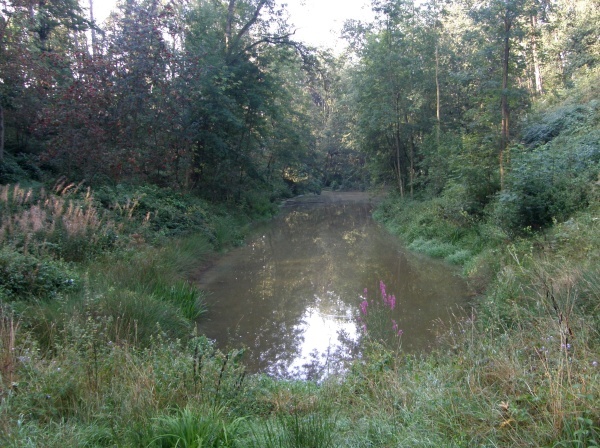 In spite of this, and for these reasons, this waterway is worth exploring. 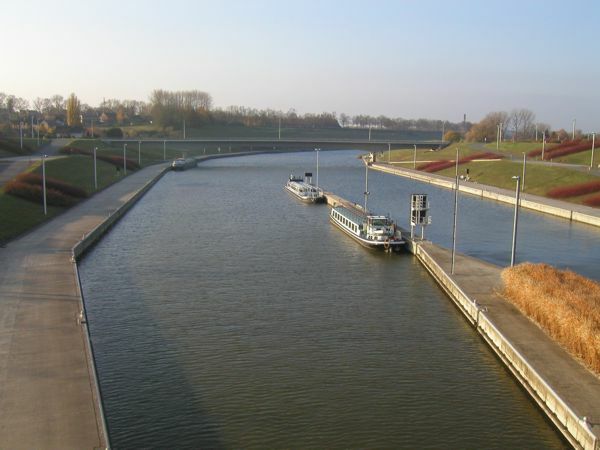 Today, there is the Main–Danube Canal, which was put into full operation in September 1992. 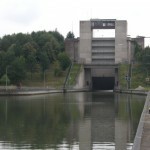 Plans to replace “Ludwig’s Canal” with a larger one were first made in 1917. 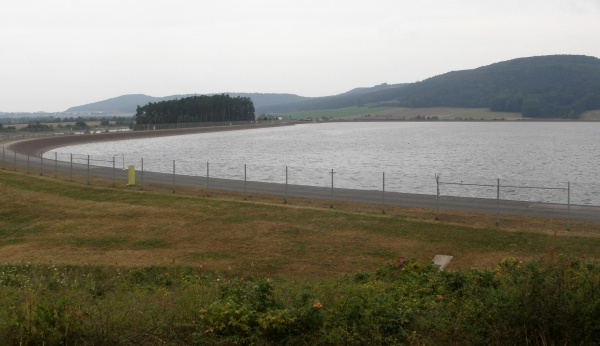 However, construction only began in 1960 and lasted 32 years, mainly thanks to “environmental” problems in the Altmühl River valley. 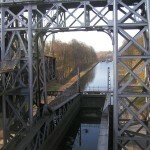 The technical parameters of the canal: The total length of the canal is 171km. 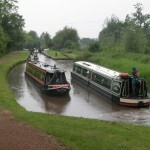 The channel is a Waterway Class Vb. That means that all shipping facilities are built for ships and ships in tandem that are up to 190m long and 11.5m wide, with a draught of up to 2.7m. The altitude difference when traversing the watershed divide (406m) is overcome via 16 advanced locks. 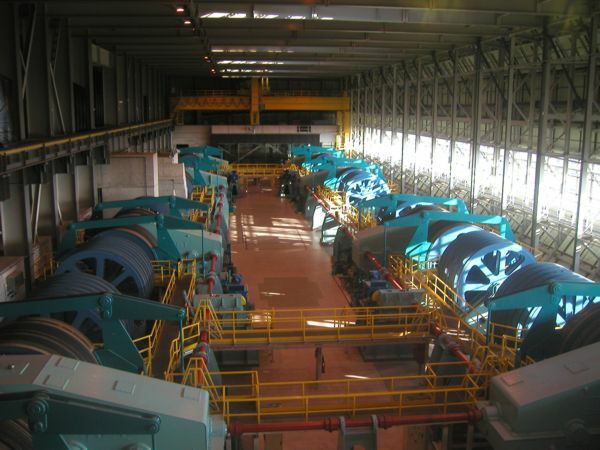 Most have an approximately 25m lifting height and some are designed to conserve water. 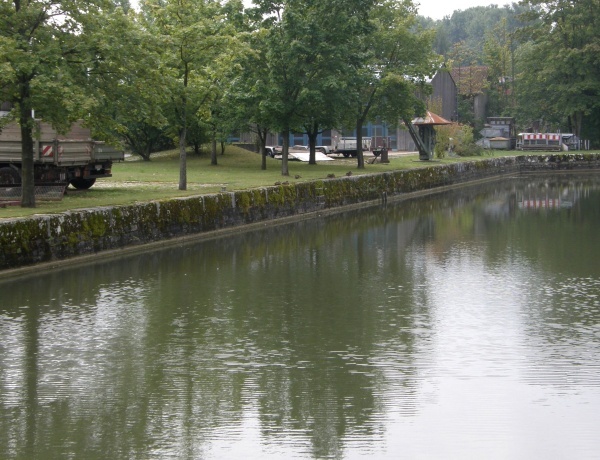 The canal is also employed for water management. 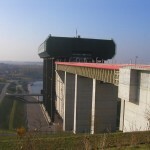 Water from the water-rich Danube basin is used for the operation of the locks and is released into the Main basin, which has less water. 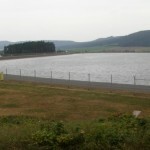 Several water reservoirs were specially built for this water management. 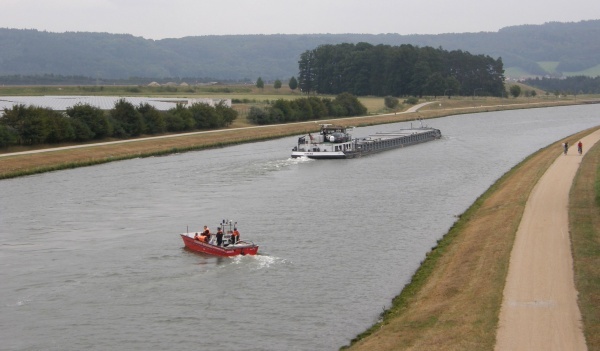 Currently, approximately 7 million tonnes of cargo “pass through” this canal yearly and it represents a very important water transport artery between northern and southern Europe. Nuremberg has become a major inland port. 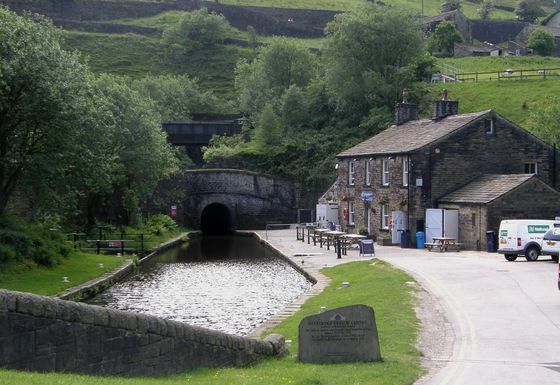 In 1794 a building of Huddersfield Narrow Canal across a highland part of The Pennines, Northern England, between Leeds and Manchester was begun. 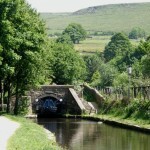 Its track included a realisation of a courageous project of Standedge Tunnel on the highest part of the canal. 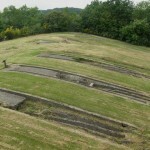 This demanding task took 17 years and in 1811 the work was finally put into operation. The tunnel was 5029 m. long, its profile was economy-sized without a paralell track. 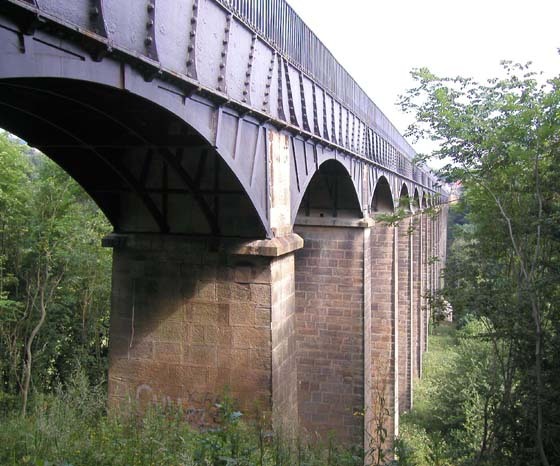 It stayed in service until 1921 when railway its main competitor – railway – took over its function and the water way started to „vanish“. 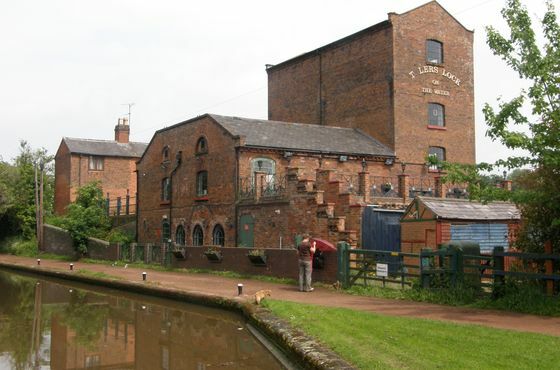 Its new era began with a boom of touring by water. 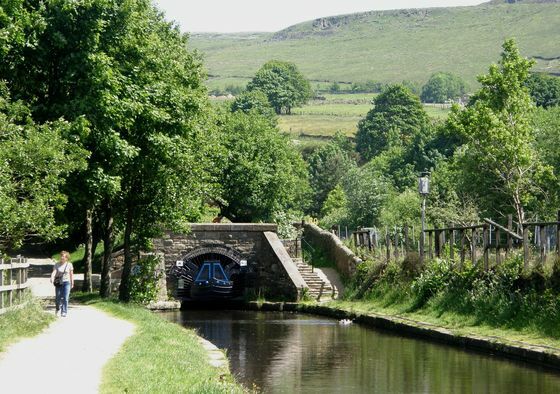 In 2001 after ten years of demanding reconstruction the tunnel and the 20 miles long canal with 74 locks, stretching from Huddersfield to Aston, was reopened. 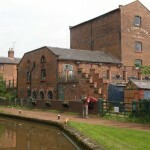 While 200 years ago this work was a technical wonder, nowadays its re-opening for a leisure navigation is also a miracle. 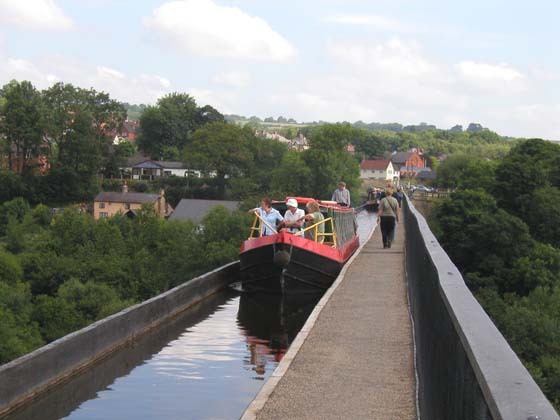 A canal head-pond itself, that „holds“ the tunnel, is also a record holder… This part of the canal is the most highly situated navigable water way in Britain: the canal water level is 197 m. above the sea level. 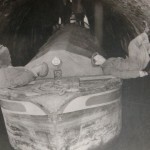 The Picture show both portále of the tunnel, a scenery of The Peninnes above the tunnel and a way of „pushing“ engineless vessels through the tunnel – „legging“. 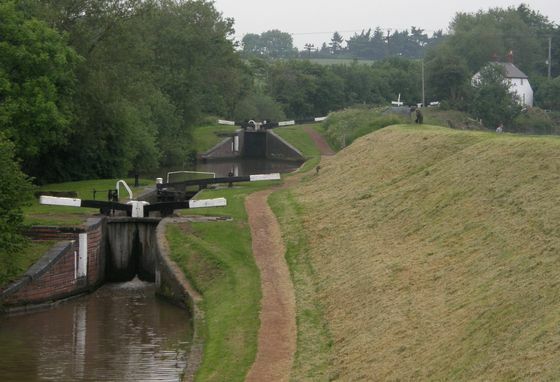 Since 1810 there are two five-locks stairs in service, that enable vessels to get over a sharp terrain breakage, situated at Foton in a Leicester part of The Grand Union Canal. 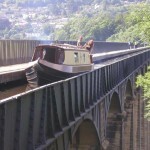 In 1900,to enlarge its traffic capacity, this set comlpeted with a unique boat-lift Foton Inclined Plane, that allowed boats to tackle 22 m high slope of the water way in space of 12 minutes. 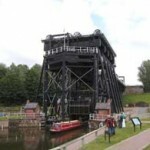 The boat lift was in service for only 11 years, then it was put out of service for technical reasons and in 1928 a technological part was dismantled and scrapped and the leftover construction started to deteriorate rapidly. 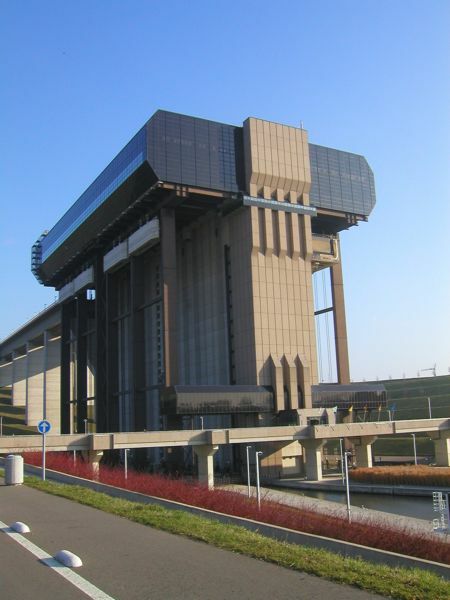 The boat lift was constructed as a double slope one with a transversal motion of two well-balanced water-trough with a utility size of 24,4 m. x 4.6 m for transporting ships up to 70 t. The lift was in its times a state of art and inspired for example a boat lift in Arzwiller, France on Marna – Rhone canal from 1960. 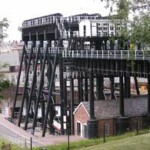 Revitalisation of the whole locality – locks and a ruin of the boat lift – was taken over by Foton Inclined Plane Trust. 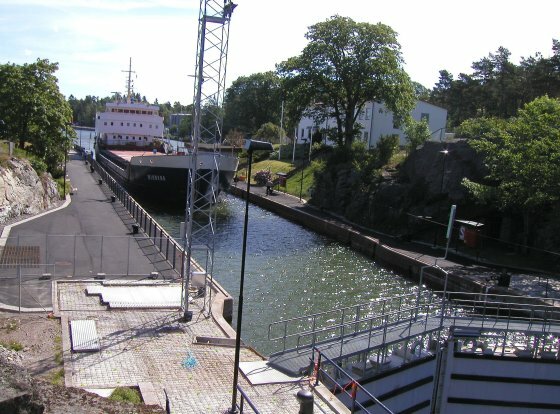 First of all they perfectly renovated the lock stairs, cultivated its neighbourhood including a house for a janitor, installed a small museum in a former water-pamping station and provided access for public by building a new road and parking place. 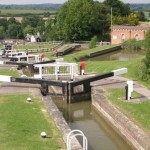 The greatest place concerne the lock itself. 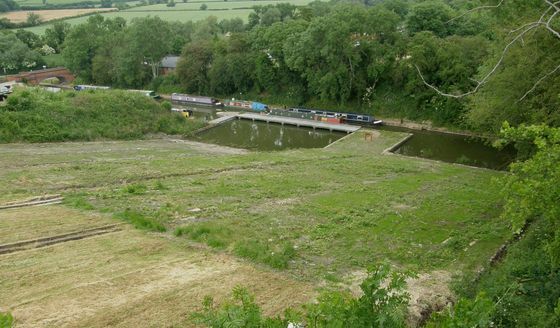 Up to now its „declined“ surface with a leftover railtrack, and a water part of a lower roadstead and an upper head race were totally reconstructed. 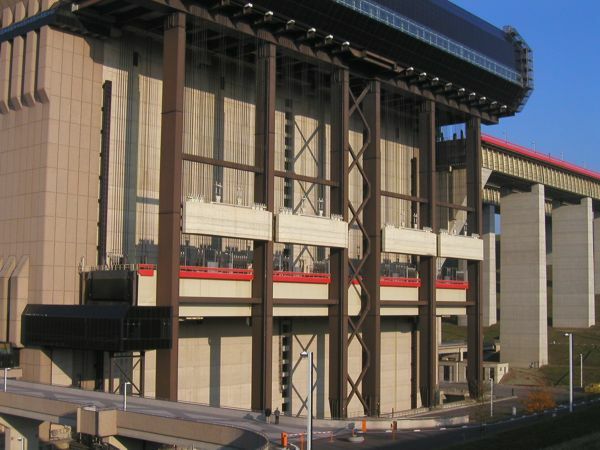 This respectable work, showing great attitude to technical sights, is not close to its end at all: there are plans for rebuilding of the lift itself and puting it into operation – if the financial situation allows. 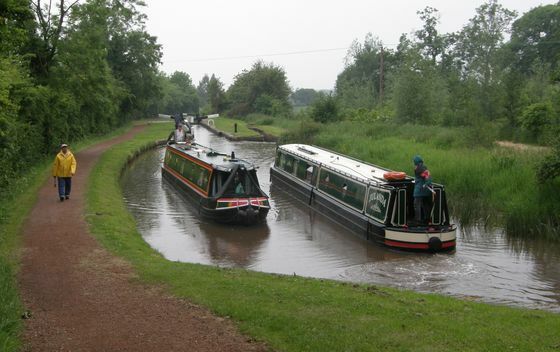 Until 1807 the Worchester and Birmingham Canal was constructed only from Birmingham to Tardebigge Warf – it was led slope contour line and without locks… For its extension to Worchester to the Riv. Sever it was neccesery to get over a „very steep incline“ of 70 m. in 3 km. 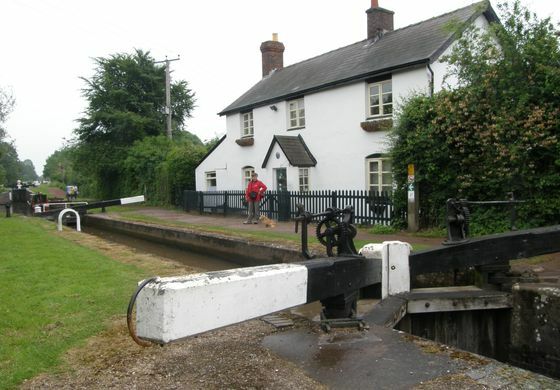 This was enabled by building 30 locks that form the longest lock cascade in Britain – Tardebigge Flight. 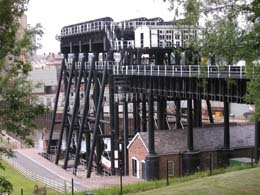 A structural part of the cascade is also a Tardebigge Engine House – a water filling station, that provides the whole system and a house of its janitor with water from a close-by water reservoir. 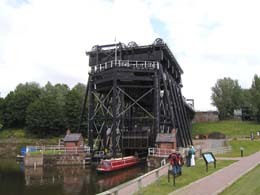 Another matter of interest is that in 1807, for about only 8 years, there was one of the very first boat lifts in service – instead of the upper and the higher locks. There is only few faded signes of its existence left in terrain. 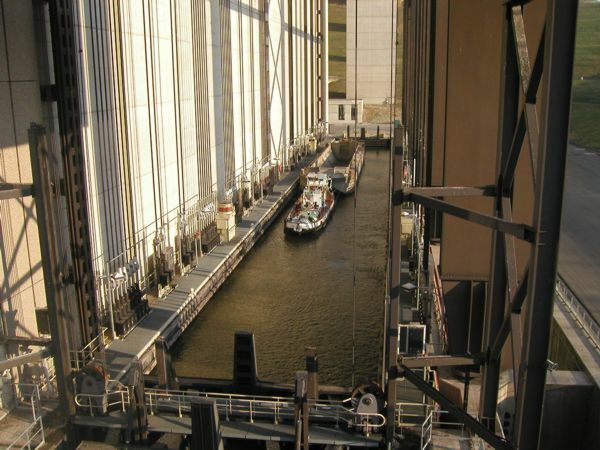 And now count with me: for passing one lock – without waiting time – about 10 – 15 minuts is needed, that means navigating through the whole systém takes 360 minutes, In space of 6 hours you can move 70 m higher (or lower) and 3 km further while working „pretty hard“ on hand operated locks. 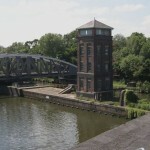 In Barton, Northern England the Bridgewater Canal used to cross Irwell Riv. 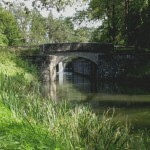 on a stone canal bridge built in 1761 by the legendary builder Brindley. To make Riv. 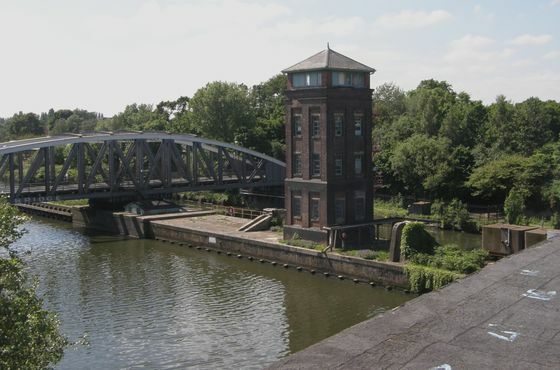 Irwell navigable all the way to Manchester for a river-marine transport (known as The Manchester Ship Canal), the old bridge was taken down and in 1894 replaced with a the Barton Swing Aqueduct. 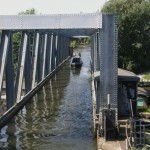 It is an unique bulit structure that enables crossing of two waterways of different categories on two different high levels. 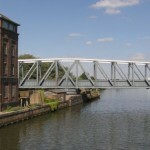 The steel construction of a canal bridge can – if needed – rotate around its axis by 90 degrees and make way for ships on the lower water way. 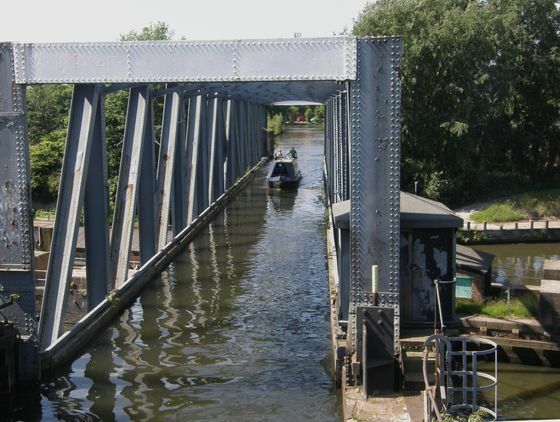 The bridge turns filled up with water – about 800 t. (plus 1500 t. of its weight) – after both ends of the canal get closed with waterproof gates. 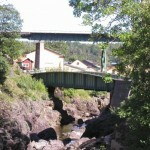 The bridge is 100m long and forms a water bed 5.8m side and 1.8m deep. 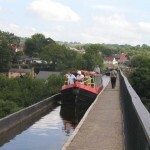 As well bystanding road bridge can swing – that is also controlled from control center of the aqueduct. 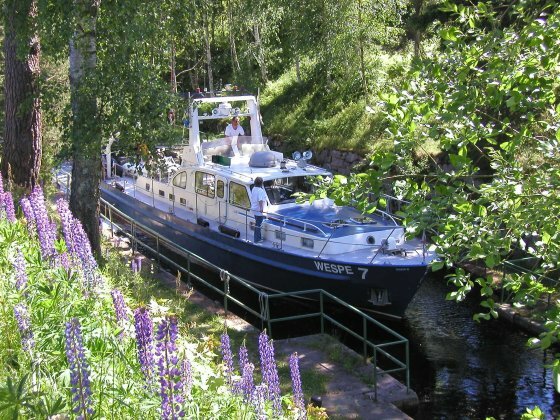 For motor-yachting and canalboating Sweden can offer not only the outstanding Göta Canal (see Travels) but also other water ways surrounded by a marvellous scenery, providing good navigational condition and also a more than sufficient number of harbours and anchorages. 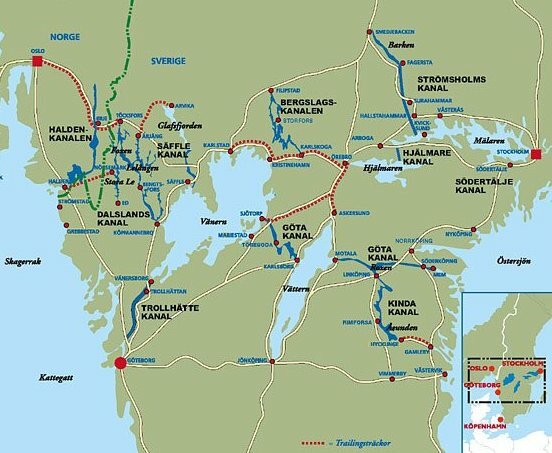 (www.sverigeskanaler.se). 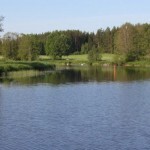 The Kinda Canal: connects The Roxen Lake at Linköping (continuation of The Göta Canal) and a forest area in the North of Ostergötland. 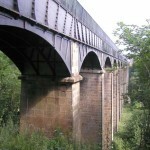 It was built, with many problems, in 1799 – 1871. 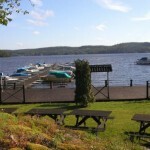 The Water way is 80 km long and its bigger part leads through lakes. 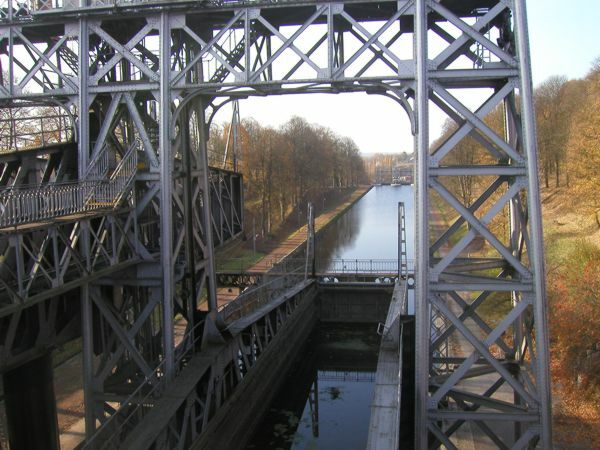 The canal itself equiped with 15 locks overcomes 53 m dH and is set out for ships 24 x 4,5 x 1,5 m with headway of 3 m. The highlight is a lock stairway by Hoventorp. 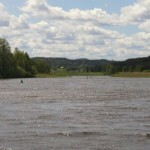 Bergslags canal: This separated water way between Karlskoga??? 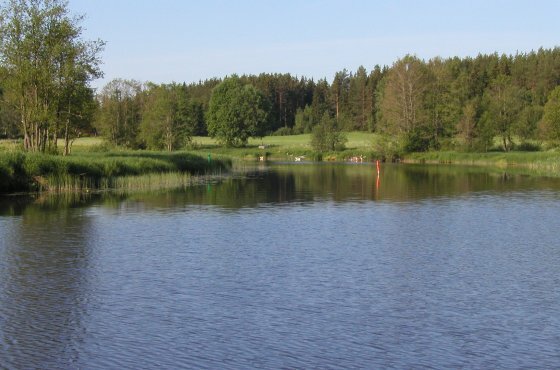 And Philipstad situated to the north from The Vänern Lake was built in 1850 – 1857 for the local goods water transport. 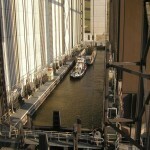 Its length is 64 km and in total six locks, that are designed for ships up to size 20 x 3,6 x 1,2m, help to overcome 16 metres dH. 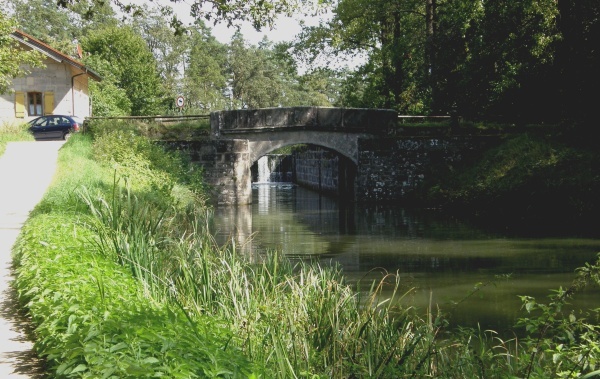 Short canal passages connect long beautiful lakes. 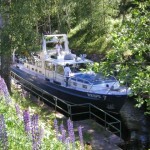 The boat itself has to be transported to the water way on land. 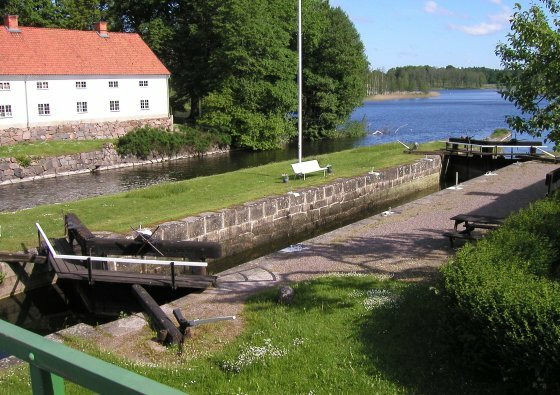 Säffle Canal (1873) is formed by only 190 m long man made part of 90 km long water way between towns Säffle on The Vänern Lake and Arvika. 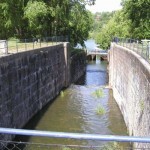 On the short canal that is situated in Säffle there is only one lock for ships of the size up to 42 x 7,5 x 3m (height 16 m). 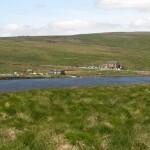 The rest of the water way is formed by few lakes connected by navigable streams. 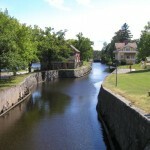 Dalslands Canal: a large water way (1864 – 1868), a real delicacy for sailors of all groups. 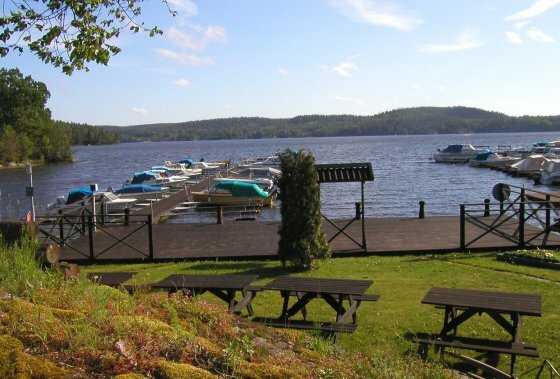 Most of its 254 km lenghts consists of dozens of small or big lakes situated in a spectacular nature. 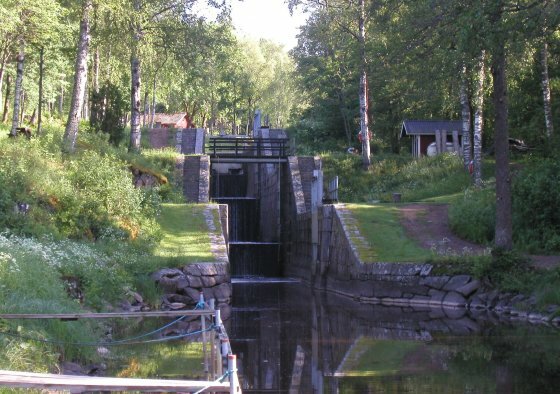 Short canals with 31 locks (22 x 4 x 1.8m – height 12 m) connect these lakes, and from its beginning Vännern, the waterway overcomes dH of 66m. 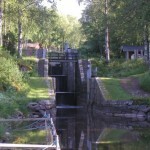 A nautical aquaduct in Häverud on the Dalslands Canal is a very interesting technical monument. 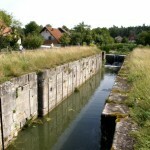 Trollhätte canal: a water way of a different kind than the others above mentioned – modern and kilobauds. 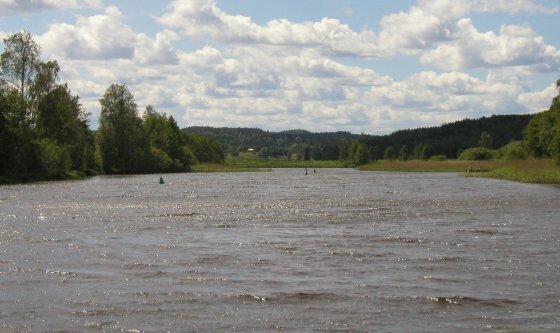 Forms a connection between the sea at Göteborg and The Vänern Lake mostly by The Göta River, also for river-maritime ships. 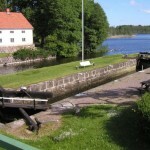 The key segment is a lock systém in Trollhättan. 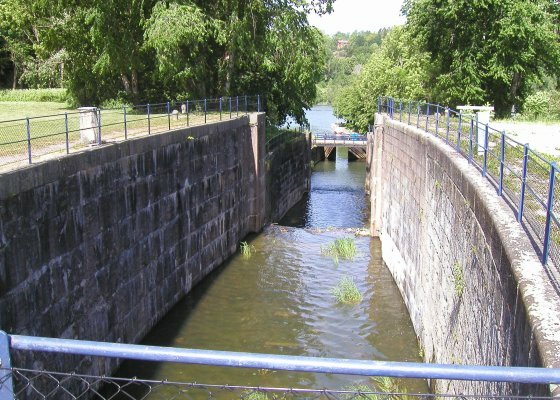 The first one was built in 1800, upgraded in 1844 and in 1916 rebuilt into a current systém of four locks overcoming 36m height difference. The current size is 88 x 13 x 5.4m. 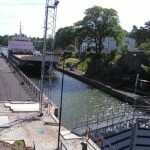 This canal together with the Göta Canal represents a very busy waterway for tourist ships acrossing Sweden from the sea to the sea. 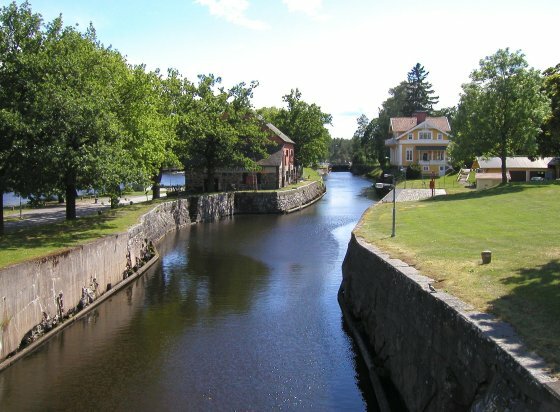 Another swedish waterways of different lenghts and sizes, that we did not have a chance to get to know, are: Hjälmare Canal, Strömholms Canal and Södertälje Canal. 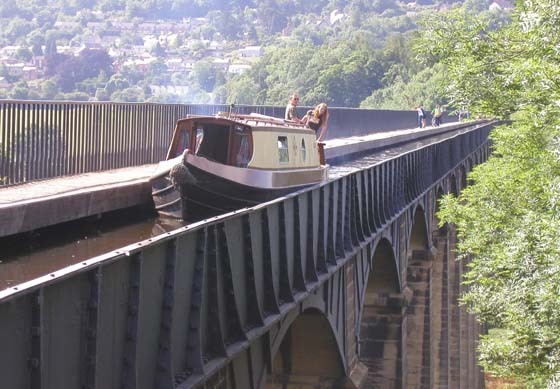 In November 1805 the Pontcysyllte aquaduct on The Llangollen canal in the nothern Walles officially started. Alike 200 years ago this work still remains admirable. 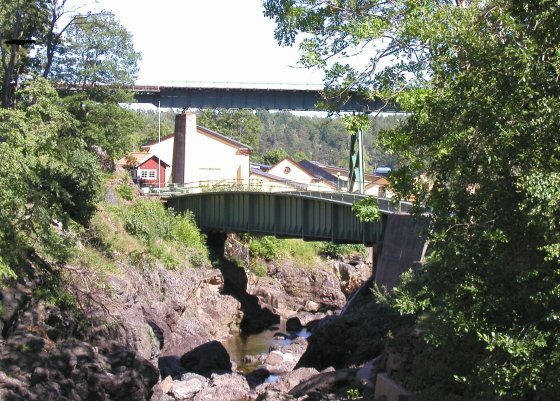 Its author CE Thomas Telford (1757 – 1834), a famous bridges and waterways constructor (Caledonian Canal in Scotland, Götakanal in Sweden…) made an excellent piece of work. 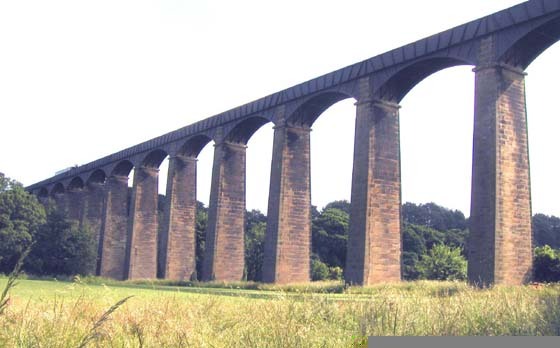 Being given a task to surpass The Dee River Valley for Ellesmere Canal Company he built the biggest and longest canal bridge ib G.B. 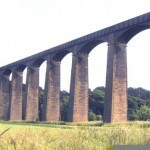 : Its height is 121 ft., lenght 1007 ft., cast-iron water-through supported by 18 stone stanchions. 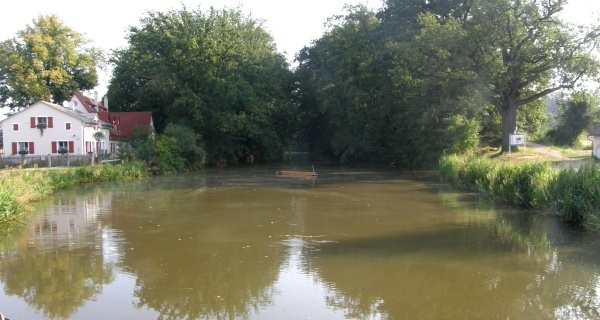 No one denies that the biggest attention to a development of waterways is paid in Belgium. 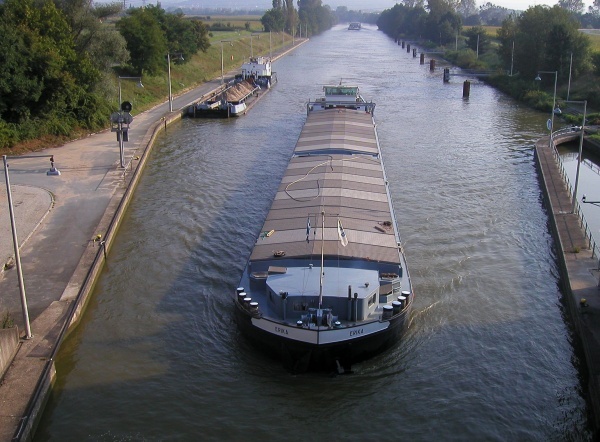 Smaller sea vessels can get from seaports deep to inland through canals and fairwayed rivers. 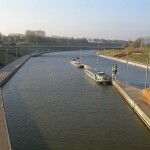 An important Belgian project was to enlarge the Canal Du Centre. 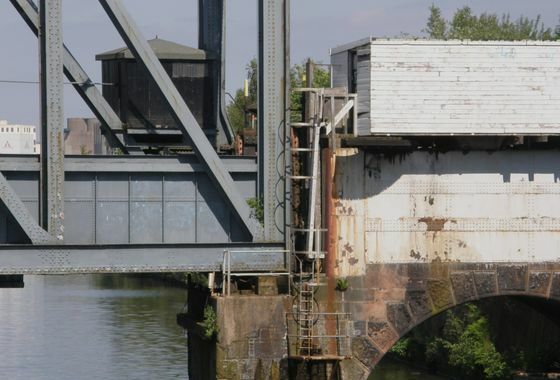 Between towns Charleroi and Mons where the canal gets over nearly 75 m height difference on a short distance, there were four original 100 years old double piston ship lifts replaced with one unique lift. 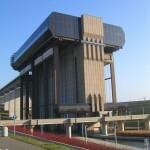 The lift was set into service at the end of 2000 in Strépy. 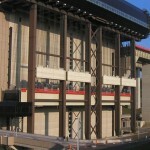 This generously concepted lift is a „World recordman“ in a category of double vertical lifts with a counterweight. 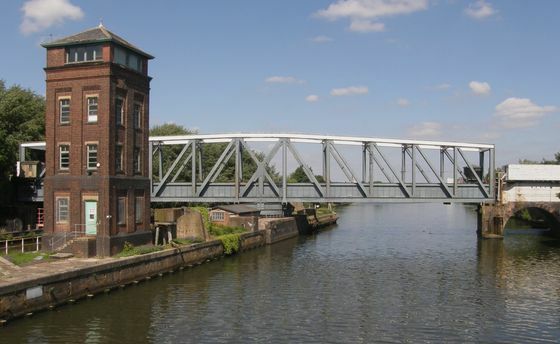 It overcomes 73 m cadence, each of its two gutters is 112 m long, 12 m wide and the water depth is 4.2 m. Also the architectectual solution to a placement in the terrain, including the upper roadstead with a canal bridge, deserves attention and admiration. 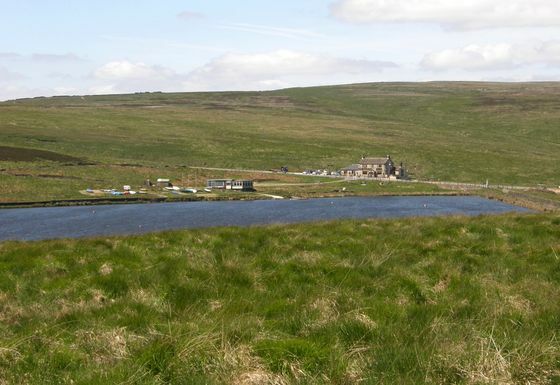 I visited the technical sight short while ago and one thing I can still hardly understand: How did the investors manage to gain space for building the work by demolishing 250 houses including a townhall and deviding the village by a deep cut of the lower roadstead into two parts? 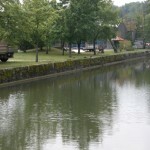 The original canal trace will be kept for water tourism and as UNESCO monumet. 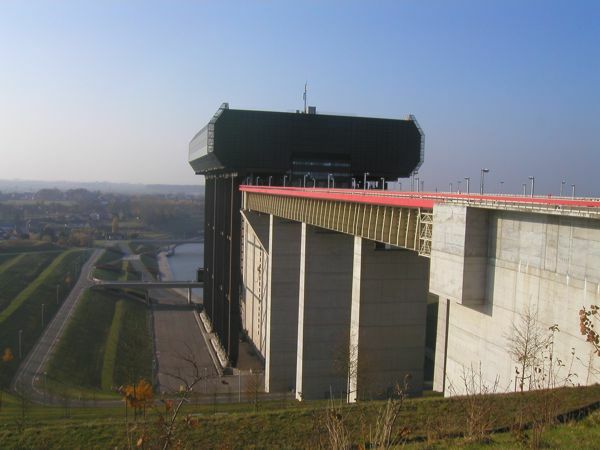 Where you find it: the object is situated close to a turn n.21 on A7 freeway from Brussels to Mons, follow sign to Ascenseur de Strepy – Thieu.